Ghana is committed to making primary health care accessible to every Ghanaian as a means of achieving the health- related Sustainable Development Goals (SDGs). Contributing to a discussion on what new measures can be adopted to facilitate the achievement of the health-related SDGs, Mr Agyeman-Manu noted that in their quest to develop their economies, many governments were grappling with competing demands on their resources. Consequently, he said, health-related expenditure was sometimes shifted to other areas, resulting in dwindling capital expenditure in the health sector. 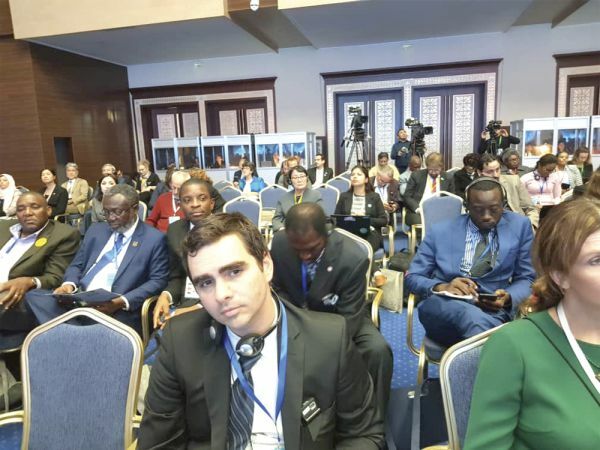 The discussions was held at a special ministerial session at the Global Conference on Primary Health Care held in Astana, Kazakhstan, which was organised by the Government of Kazakhstan, the World Health Organisation (WHO) and UNICEF. It was to mark 40 years of the Alma-Ata declaration on Primary Health Care. The deliberations centered on the Action Plan for Healthy Lives and Well Being for All, the landmark commitment to find new ways of working together to accelerate progress towards achieving the United Nations’ SDGs which was recently signed by 11 heads of the world’s leading health and development organisations. The commitment follows a request from Chancellor Angela Merkel of Germany, President Nana Addo Dankwa Akufo-Addo of Ghana, and Prime Minister Erna Solberg of Norway, with support from the United Nations Secretary-General, Antonio Guterres, to develop a global action plan to define how global actors can better collaborate to accelerate progress towards the health-related targets of the 2030 Sustainable Development Agenda. The Global Action Plan will also enhance collective action and leverage funds to address gender inequalities that act as barriers to accessing health, and to improve comprehensive quality health care for women and girls, including sexual and reproductive health services. The organisations that have already signed up to the Global Action Plan for Healthy Lives and Well-being for All are: Gavi the Vaccine Alliance, the Global Fund to Fight AIDS, Tuberculosis and Malaria, the Global Financing Facility, UNAIDS, UNDP, UNFPA, UNICEF, Unitaid, UN Women, the World Bank and WHO. The World Food Programme has committed to joining the plan in the coming months. Discussing the topic, “Action Plan for Healthy Lives and Well Being for All: Uniting global health organisations to accelerate progress towards the health-related SDGs”, Mr Agyeman-Manu stressed that achieving the health-related SDGs calls expansion of roads and health infrastructure, retooling and tooling of health facilities, training and employment, among others. Citing Ghana, as an example, he said the government was providing free postgraduate training for medical officers as a means to improve the capacity of public facilities to provide quality care. “We are using that policy to redirect training into primary health care and other specialties so that we can have people who can work in the rural areas and can manage general hospitals rather than specialist hospitals to enable access and equitable distribution of quality health care,” Mr Agyeman-Manu stated. Ghana, he added, was also training about 50 nurses from Sierra Leone in some of its health training institutions, with sponsorship from Medicins san Frontiere. During the conference, Mr Agyeman-Manu also had separate meetings with the WHO, Director-General, Dr Tedros Adhanom Ghebreyesus and Dr Yelzhan Birtanov, Minister of Health of Kazakhstan. In his meeting with Dr Tedros, the two discussed the possibility of Ghana being used as a model to declare universal health coverage at the primary health care level. The health minister called for financial and other support to achieve this, stressing that as Ghana already had a national health insurance scheme which takes care of the indigent group, aged, children below 18 and pregnant women for free, the country, with a little support can achieve universal health care at the very basic level. He also discussed investment opportunities between Ghana and Kazakhstan with Dr Birtanov, especially within the health sector. He called on Kazakhstan to open its doors to Ghana and explore Public-Private-Partnership opportunities not only in health but also in other sectors of the Ghanaian economy. "Govt is committed to water sustainability"